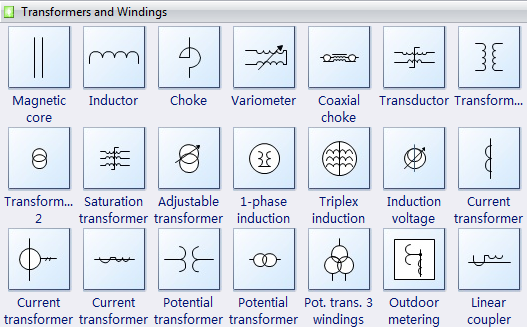 The following transformer symbols show some standard electrical transformer symbols for industrial control systems such as magnetic core symbol, inductor symbol, choke symbol, variometer symbol, transductor, induction, induction voltage, current transformer, linear coupler symbol, etc. 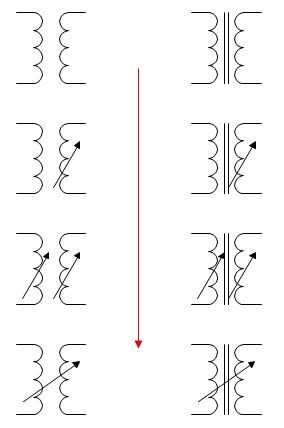 Every transformer symbol can be configured by the action button. In our Industrial Control System Diagram Software, you can use the action button to choose the right electrical symbols with one single click.